Quinoa cooks up in about 20 minutes, so these quinoa recipes are quick and easy to prepare. 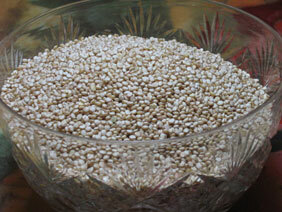 Quinoa (pronounced keen-wa) is a real super food, with almost twice the protein content of other grains. It is also high in magnesium, iron, potassium, copper, zinc and minerals. It originates from South America. It is gluten free, has a delicious nutty flavor and is easy to digest. Quinoa can replace grain in any recipe. 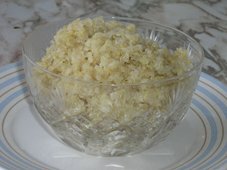 Most quinoa sold has been processed to remove the coating, saponin, a natural deterrent to insects and birds, which can be bitter. But it is still a good idea to rinse your quinoa before cooking. Cook up a big batch and store it in your refrigerator. I always keep some cooked quinoa on hand, so I have a dish like rice or pasta that goes with any meal. You can find quinoa in your health food store and often many grocery stores. Bring almost to a boil, then cover, reduce heat to minimum and simmer for 15 minutes. This delicious quinoa salad was adapted from one of my favorite cook books, "May All Be Fed, Diet for a New World" by John Robbins. It is perfect in summer with fresh cucumbers and tomatoes. Increase the parsley to increase the iron and nutrients. Put the quinoa in a wire strainer and thoroughly rinse. In a medium saucepan, bring the water and quinoa to a boil over high heat. Reduce the heat to low, cover and simmer until the water is absorbed, 12 to 15 minutes. Transfer to a bowl and cool completely. Stir the tomatoes, green onions, cucumber, bell pepper, parsley and mint into the quinoa. You can cut the stems off the parsley and then chop in a food processor to save time. In a small bowl, whisk together the lemon juice, oil, garlic, salt and cayenne pepper. Pour over the quinoa and toss well. Cover and refrigerate for at least 30 minutes before serving.